Intellect and intuition both play an important role. You cannot rely purely on meditation practice alone, without experiencing a sharpening of your basic intelligence, and in order to understand the sense behind the words, you have to have personal meditative experience. 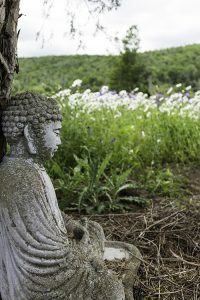 This practice and study retreat will bring together mindfulness/awareness practices with contemplation and analytical meditation. There will be an emphasis on the relationship between Shambhala and Buddhist teachings. Core themes like basic goodness and suffering, karma and egolessness, fear and doubt, awakened heart, dignity and sacredness will be examined. A Manjushri practice as well as a light form of debate practice will be introduced. This program may be of interest particularly to people who would like to teach within Shambhala. One can attend the full retreat or just the weekend. Please plan on arriving between 3-6pm on Friday, July 19, 2019, to register and check-in. Dinner is offered at 6:30pm. The program begins that evening at 7:30pm. The weekend program ends around 4:30pm on Sunday, July 21, 2019. Shambhala Training Level 5 & completion of a weekthun. Benoît Côté has been a student of Shambhala Buddhism since 1976. For many years, he was a member and part of the teaching and administrative staff of Centre Shambhala de Montréal. In 2002, he retired from his university professor position in Educational Psychology to be involved fully with Shambhala. He then started being part of the teaching staff of international seminaries and directing programs at the land centers. 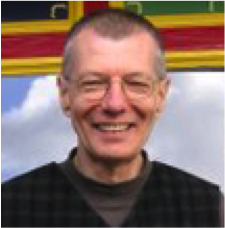 From 2005 to 2007, he was resident teacher at Karmê Chöling and member of the Mukpo Institute faculty. In 2009, he moved to Halifax, and in 2010, was appointed by Sakyong Mipham Rinpoche as one of the shastris for the Halifax Shambhala Center. In 2015, he moved back to Montréal where he also served as shastri until 2018.